The guidance and navigation (or "G&N") system was a central concern in spacecraft design. To get to the moon and back to earth was a monumental task. NASA and its predecessor, NACA, had little experience in this field; but neither had anyone else. When NASA opened for business in 1958, more work had been done in celestial mechanics for trips to Mars than to the moon. MIT, in fact, had an Air Force contract that included research on interplanetary guidance and navigation. Out of this came a relatively extensive study for an unmanned probe to pass by and photograph Mars. By the time it was finished, however, this kind of role in space belonged exclusively to NASA. MIT was the obvious place for NASA to look for help in Apollo's astronavigation problems. 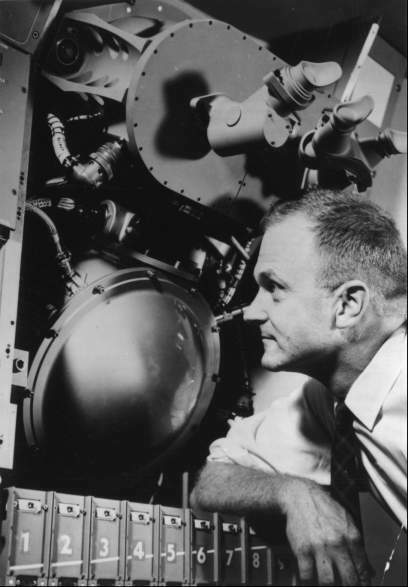 For many years, Charles Stark Draper, Director of MIT's Instrumentation Laboratory, had been recognized as the man most directly responsible for the application of automatic pilots and inertial guidance systems.17 Achievements in such second-generation intercontinental ballistic missiles as the Polaris made Draper's laboratory the logical solesource choice for the Apollo system. 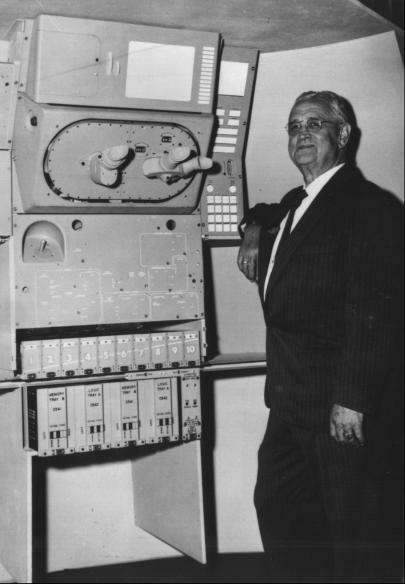 Navigating to the moon: MIT Instrumentation Laboratory Director C. Stark Draper inspects a mockup of the Apollo guidance and control system in the September 1963 photo above. David G. Hoag, technical design director at the laboratory, examines the inertial measuring unit that would measure changes in Apollo spacecraft velocity when propulsion systems were fired. Draper's offer to serve as an astronaut caused a ripple of laughter throughout NASA Headquarters, but only for a moment. There were other problems to resolve. The basic rocket booster for the moon mission was still in question, and NASA's administrators were in the process of selecting a spacecraft manufacturer. * Before and during the Apollo feasibility studies, the Ames center had focused on guidance and navigation as the area where it could be most useful to Apollo. Stanley F. Schmidt had looked at midcourse guidance; Dean R. Chapman anti Rodney Wingrove had concentrated on reentry guidance; and G. Allan Smith had worked on instrumentation for the astronauts' onboard operations. ** On 10 May 1960, the U.S.S. Triton completed a 66,800-kilometer submerged cruise around the globe. 14. Richard H. Battin, interview, Cambridge, Mass., 29 April 1966; Jack Funk, interview, Houston, 25 June 1970; John W. Finney, "Washington Praises Shot; Hopes for Sharing of Data," New York Times, 14 Sept. 1959; "NASA Initiates Study on Impact of Space," Aviation Week & Space Technology, vol. 72 (1 Feb. 1960); Milton B. Trageser, interview, Cambridge, 27 April 1966; Stanley F. Schmidt to Harry J. Goett, 9 June 1961; Goett to Silverstein, 16 June 1961; Piland to Assoc. Dir., STG, "Possible MIT Guidance and Control Study for Apollo," 4 Nov. 1960; Piland note to Donlan, "Apollo activities," 9 Nov. 1960; Robert G. Chilton to Assoc. Dir., STG, "Meeting with MIT Instrumentation Laboratory to Discuss Navigation and Guidance Support for Project Apollo," 28 Nov. 1960; Trageser to Donlan, 2 Dec. 1960, and 22 Dec. 1960, with encs., "Technical Proposal to NASA . . . Space Task Group, for a Guidance and Navigation System Study for Project Apollo," 23 Dec. 1960, and "Cost Proposal to . . . Space Task Group, for a Guidance and Navigation System Study for Project Apollo," 23 Dec. 1960; Chilton to Assoc. Dir., STG, "Massachusetts Institute of Technology Guidance System Study for Apollo," 16 Jan. 19-61; Piland, "Apollo Programing - January 1961," n.d.; Chilton to Assoc. Dir., STG, "Visit to Massachusetts Institute of Technology Instrumentation Laboratory, March 23, 24, 1961," 3 April 1964. 15. Thomas P. Hughes, Elmer Sperry: Inventor and Engineer (Baltimore: Johns Hopkins Press, 1971); Funk and Trageser interviews. 16. William R. Corliss, Histories of the Space Tracking and Data Acquisition Network (STADAN), the Manned Space Flight Network (MSFN), and the NASA Communications Network (NASCOM), NASA CR-140390, June 1974. 17. C. S. Draper, "The Evolution of Aerospace Guidance Technology at the Massachusetts Institute of Technology, 1935-1951," paper presented at the 5th IAA History Symposium, Brussels, Belgium, 19-25 Sept. 1971; Vannevar Bush, Pieces of the Action (New York: William Morrow, 1970), p. 170. See also background and brief history of Draper in C. Stark Draper, Walter Wrigley, and John Havorka, Inertial Guidance (New York: Pergamon Press, 1960), pp. 14-23. 18. Chilton to Assoc. Dir., STG, 3 April 1961; Schmidt to Goett, 9 June 1961; Goett to Silverstein, 16 June 1961. 19. Richard H. Battin, Astronautical Guidance (New York: McGraw-Hill, 1964). 20. David W. Gilbert, "A Historical Description of the Apollo Guidance and Navigation System Development," SG-100-153, 31 Dec. 1963, with encs. ; William W. Petynia to Assoc. Dir., STG, "Visit to MIT, Instrumentation Laboratory on September 12-13, regarding Apollo Navigation and Guidance Contract," 21 Sept. 1961; idem, "Second Apollo monthly meeting at MIT, Instrumentation Laboratory, on October 4, 1961," 10 Oct. 1961. 21. Milton B. Trageser and David G. Hoag, "Apollo Spacecraft Guidance System," MIT-IL Rept. R-495, paper presented at the IFAC Symposium on Automatic Control in the Peaceful Uses of Space, Stavanger, Norway, June 1965; Richard H. Battin, "Apollo NGC in the Journals," Astronautics & Aeronautics 9 (January 1971): 22--23; Robert G. Chilton, "Apollo Spacecraft Control Systems," in John A. Aseltine, ed., Peaceful Uses of Automation in Outer Space (New York: Plenum Press, 1966); Aaron Cohen, "Powered Flight Steering and Control of Apollo Spacecraft," paper presented to Northrop Nortronics Society of Automotive Engineers Committee, Houston, 11-13 Dec. 1963. 22. Draper, interviews, Cambridge, 23 April 1968, and Houston, 27 Aug. 1973; Draper to Seamans, 21 Nov. 1961; Eugene M. Emme, Aeronautics and Astronautics: An American Chronology of Science and Technology in the Exploration of Space, 1915-1960 (Washington: NASA, 1961), p. 123.